The rains and the warmer water have the sturgeon on better bite. 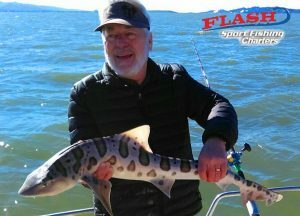 Yesterday Flash II had a sturgeon, 5 leopard sharks, 3 sevengill sharks 5 shaker bass with one keeper and 2 halibut that were 21 inches each. All that action on a half day trip. Myself on Flash I had a 2 man charter. 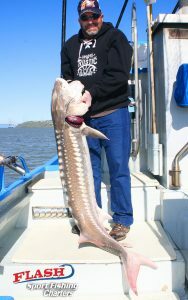 They landed 4 sturgeon and one 59 ¾ inch, 44 inch and 2 jumbo shakers. There were also some good opportunities missed. I thought the 59 ¾ inch sturgeon might be a female. So to the man from Minnesota’s credit decided to release the sturgeon. Today I took the Martinez harbor girls out for a few hours. Judi from the bait shop landed a good sturgeon. Lori landed a bass. I will be back out on Thursday and I have room. Enjoy the photos. While out in Marina Dunes visiting my son and his family, we decided to go sturgeon fishing. 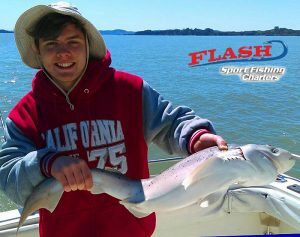 We found Flash Sport Fishing Charters and Capt Steve. 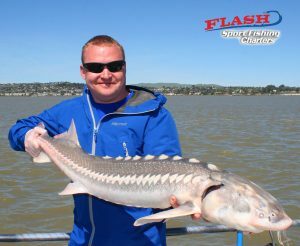 With his years of experience fishing the San Francisco Bay area, gave my son and I one of the best fishing experience ever! I landed a 59 and 3/4 inch sturgeon and my son landed a 44″ sturgeon. We landed a couple more and missed chances at others. Thanks to Capt Steve this was a fishing trip I will cherish forever.